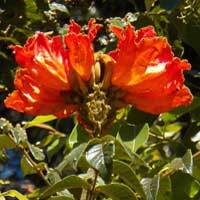 Stately tree with dark green, compound leaves and large clusters of big, orange-red flowers. 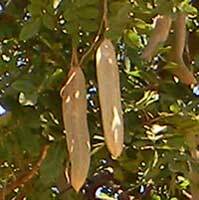 Long and heavy fruits hang from the branches like so many sausages set to age. Remarkable flowers also that release scent at night. Pendulous spikes of cranberry-colored trumpet flowers from the underside of high branches. 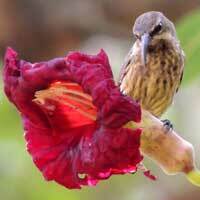 Sunbirds often visit. 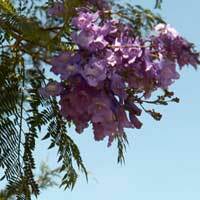 Small to medium sized tree with dark green compound leaves and showy, bell-shaped flowers. Tenacious climber with unique paired, bifoliate leaves at each node. 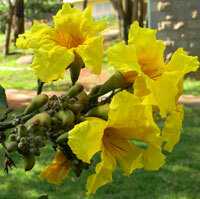 Yellow trumpet flowers. Vivid blue-purple flowers on large tree with finely compound leaves. 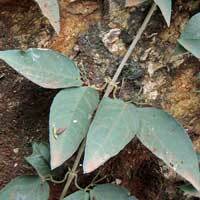 Widely cultivated, but is it reproducing in Kenya? 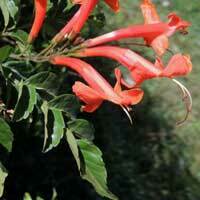 Medium-sized shrub with dark green compound leaves and showy, orange-red tubular flowers. Widely cultivated South African native. By no means am I an expert on the Natural History of Kenya because I am so new to exploring this part of the World. By creating a page for the species as I learn them I am teaching myself, sharing with others. If you find an error or appreciate my efforts please send me a message.